Karate training will make you more flexible. Can't find your answer or looking for something? Click the Search button above - it searches our entire website. I wanna get started... now what? Great! We would love to have you as our student. And we will do everything in our power to help you achieve your goals! Just pick up the phone and call us at 336-288-8399, email us at cvptkd@gmail.com or fill the form on the right. You can also simply stop by in our beautiful, safe and clean facility. Students develop self-esteem and are more confident. You will do martial arts...! Kick, punch, yell, sweat, jump, lose weight, gain muscles, tone your body, learn to break wood, self-defense, meet exciting people, make new friends, improve your concentration, gain self-esteem, focus, increase your agility and stamina. You will learn to relax and calm your body when needed. You will start feeling better about yourself and much more. Board breaking is fun and also tests our skills. Are you at least 4 years old? Good! You can do it! How about... how many times a week? Kicking is important as legs are longer and stronger than arms, providing element of surprise to the opponent. 2x a week is recommended. We encourage all students to try to come 3x a week for best results. Setting a schedule and being consistent is very important to your advancement and goal accomplishment. It is better to do 2 classes every week than missing a week and then trying to make it up the next week. Additionally, students that do not come to class consistently often feel out of place and then do not want to come to class. Students that do come on a consistent basis feel better and actually look forward to coming to class. And what do I wear? For your free trial workout you can wear clean sports pants and a t-shirt. For women we also recommend wearing a sports top. Please leave all jewelry at home as these may cause an injury to you or other students. We train barefooted. 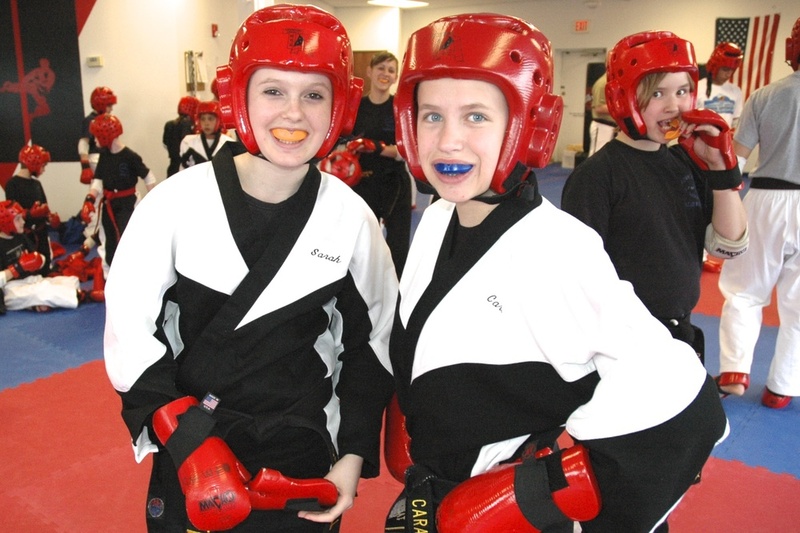 Our martial arts students develop lasting friendships. We expect our students to give their best effort. Technique at the early stages of training is not as important as a positive attitude. If a student tries hard and has a good attitude, they will develop better technique over time because they are listening and learning. When do I get my Black Belt? It is mathematically possible to become a 1st Degree Black Belt in about two and a half years if you have consistent attendance and pass all testings successfully. However, it takes most people longer to attain that rank. Remember, grasshopper, the 1st Degree Black Belt is just a beginning, not the end, of serious training. Black Belt indicates that the wearer is a serious student of the art. Can we come watch a class? Definitely! However, we recommend that you come in and actually try the class. It will be a fun experience, and you will get a better feel for it. Then you can decide whether you like it.